On Creation Day 6, God made the land animals. This included one class of creature usually lost in translation: the dinosaur. Many creation advocates have a problem with dinosaurs—or so they think. They see no references to dinosaurs in the Bible. More than that, they cannot conceive that a creature that once grew to tremendous size was ever small enough, and lightweight enough, to ride in Noah’s Ark. And if dinosaurs did travel aboard the Ark, where are they today? But the Bible does mention creatures that can only be dinosaurs. The poet Job knew of two of them. One, Leviathan, God made with the other creatures of the sea. The other, Behemoth, walked on land. From the detailed description that Job gives, Behemoth is not, as the Geneva and King James translators supposed, a hippopotamus. (Behemoth’s tail is as big around as a cedar trunk, and the hippo’s tail is much more slender.) 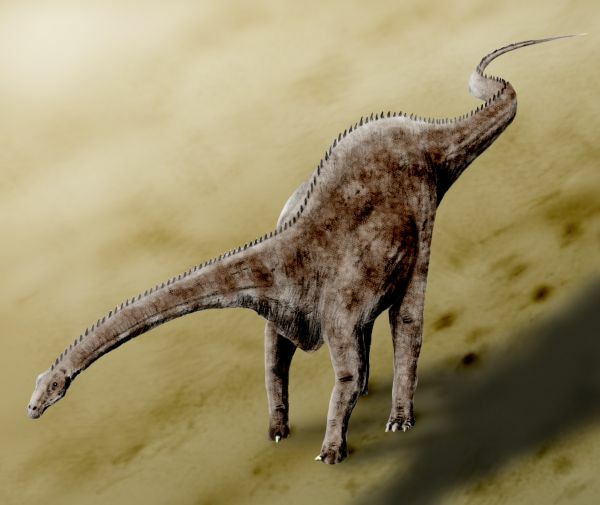 Behemoth is either Diplodochus or Brachiosaurus. Creation Day 6: What’s in a name? Diplodochus carnegii, artist’s concept. Graphic: Nobu Tamura, CC BY-SA 3.0 Unported License. But the Hebrew text uses the word behemah, which the New American Standard translators, like King James’ Royal Commission before them, rendered as cattle. But that word does not mean “cattle.” It means a very large animal, as opposed to the far smaller animals that “creep on the ground” (worms, insects, spiders, etc.). Now God commanded, “The earth [or The land] shall produce living creatures of all kinds: large animals, ground creepers, and other animals of the earth, of all kinds!” And so it came to be. God made all manner of animal kinds, large animals after their kinds, and ground creepers after their kinds. God deemed this good. Meaning that God saw this as a finished work, the finish of a two-day process for creating all the animals that swam, flew, or walked on earth. Now God was ready to make His most exacting and marvelous creature: man. That is an excellent post!! The video clip is one of the best I’ve seen. The Hebrew transliteration might not make sense to some, but here’s what it looks like ‘dissected’ …. The difference between ‘behemah’ & ‘remes’ is probably the type of movement. ‘Behemah’ generally have straight legs, so their flexibility is ‘limited’, whereas ‘remes’ have the ability to creep. (It could be a snake, a monkey, a cat, a mouse, a lizard, etc.) Chayto are probably the living creatures that breathe through their skin (insects, bugs, worms etc) because we don’t see Noah being told to take them on the Ark in Genesis 6. And thank you Terry for giving us these opportunities to share our thoughts on your posts! And I thank you for sharing. Come to think of it, God did ask Adam to name the animals, after giving Adam a language with roots to name things with. Question: I have had the impression, since I researched Eliezer ben-Yehuda (“The Renovator of the Hebrew Language”), that modern Hebrew differs from classical Hebrew chiefly in vocabulary. That is, Ben-Yehuda and his successors expanded the Hebrew vocabulary in a manner that they at least tried to keep consistent with its roots. Is my impression correct? And how good a job would you say that Eliezer Ben-Yehuda and the Academy of the Hebrew Language have done? My apologies for taking so long to answer this one. Hebrew has been kept alive throughout the centuries in the Synagogue, in the reading of the Hebrew Torah & the Hebrew Liturgy. The guys would get together to study the Hebrew text , & they would send their sons (if they could afford it ) to Hebrew school when they reached a certain age in order to study the Hebrew Text & various Hebrew scholar’s writings (some of which presumably date all the way back to Moses, but aren’t in the Hebrew Text). Outside of the synagogue Hebrew was not spoken as a common everyday language. The way I understand it is that The Jews who fled from Spain during the Inquisition [around the same time as Columbus discovering the Americas] took their Hebrew accent with them to Israel . (The accent is called ‘Sephardic’). ( There are other accents, just like the difference between the English that is spoken in the USA & the English spoken in Australia. One would be ‘Ashkenazi’ which is the accent that the guys in Brooklyn use (it came from the European Jews who lived in Germany, Poland, Russia, etc). And then there’s the Yemenite accent (from Yemen) which is where we get our pronunciation of ‘YAHWAY’ from.) The choice for which accent to use for modern Hebrew became ‘Sephardic’. Then they had to invent Hebrew words for modern items. I’m still very much in the process of learning Hebrew, & probably will be for the rest of my life. What I can tell you at this point is that anyone who speaks the Hebrew language can read the Hebrew Scriptures, & the understanding is there as to what the Hebrew Text is saying [Whereas in comparison, when you read an old King James Translation English Bible, it’s extremely hard to understand, especially if you are un-churched]. Thanks for the background on Sephardic, Ashkenazic, and Yemenite Jews. Well, then! We shall create one! And then he thought of Hebrew, the one language that at least some Jews could be counted upon to know how to speak anywhere in the world. Before Ben-Yehuda, Jews could speak Hebrew. After him, they did. Hebrew in the home: exclusive use of Hebrew within a household. Hebrew in the school: intensive and exclusive instruction in Hebrew. The schoolmasters at the Alliance School in Jerusalem loved the idea. It saved them having to recruit instructors in the well over a hundred languages that some of their students spoke. Words, words, words. These Ben-Yehuda invented, using original Hebrew roots and connecting them in ways that would best express the modern concept. He refused to borrow words from other languages. Hebrew has slept two thousand years, but that’s all right. We’ll wake it up with—what’s the word? We’ll start tonight! And we will write the words for iron, bomb, and chairs! Like cauliflower. And ice cream. The dictionary was his dream. From the Ballad of Eliezer Ben-Yehuda, or at least my attempt at a lyrical translation. So successful was he that the British Mandatory authorities eventually recognized Hebrew as an official language. Ben-Yehuda formed a committee to invent the modern words. That committee survives today as Ha’Aqademia LaLashon Ha’Ivrit (The Academy of the Hebrew Language), Hebrew University, Jerusalem. I’ve read some stuff about him, but not his biography yet. The one you referred to sounds really good. What’s it’s title? Also, in Israel, a grenade is called a pomegranate! That’s one of those items that King David didn’t know anything about! Here is the article I wrote at CreationWiki on Eliezer Ben-Yehuda. His name came up in my research on the Hebrew language. I wanted to know how far modern Hebrew might have diverged from classical Hebrew. In the process, I learned that it had gone out of everyday use two thousand years ago. Ben-Yehuda sought to bring it back and expand its vocabulary without fundamentally altering its meaning or usages. So Hebrew remains today the synthetic language it was in King David’s day. My favorite Eliezer Ben-Yehuda story was his deathbed story. Well-wishers crowded in to his room, but they started speaking each in his own Diaspora language. He roused himself long enough to say, “Hebrew! Hebrew! Speak Hebrew! Don’t assault my ears with this polyglot cacophony!” Or words to that effect. His son calmed him down, and assured him of the success of Hebrew. My article has links to all the sources I had on Ben-Yehuda. I also have three embedded videos, including two renditions of the Ballad of Eliezer Ben-Yehuda. I would publish my own lyrical translation, but I’m not sure that I have any right to do such a thing, or from whom I would have to ask permission.